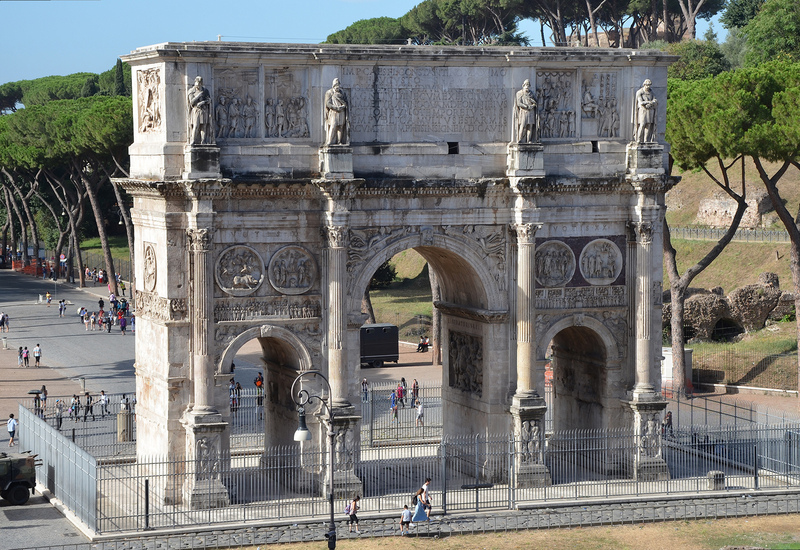 The Arch of Constantine, dedicated on 25 July 315 AD, stands in Rome between the Colosseum and the Palatine Hill, at what was once the beginning of the Via Triumphalis. 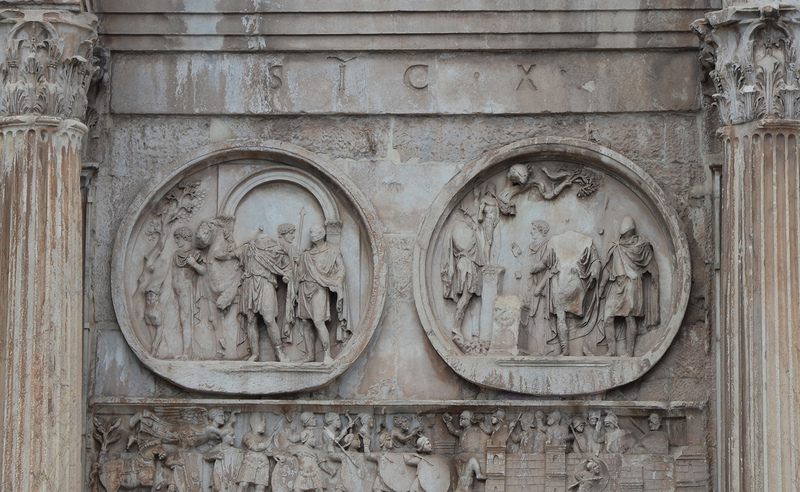 As described on its attic inscription, it commemorates Constantine’s victory at the Battle of the Milvian Bridge on 28 October 312 AD over the tyrant Maxentius who had ruled Rome since 306 AD. 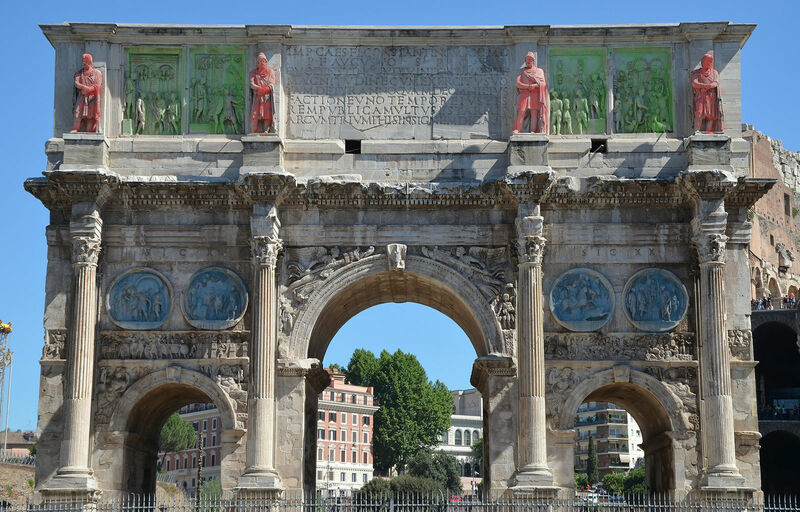 It is one of the largest surviving Roman triumphal arches. 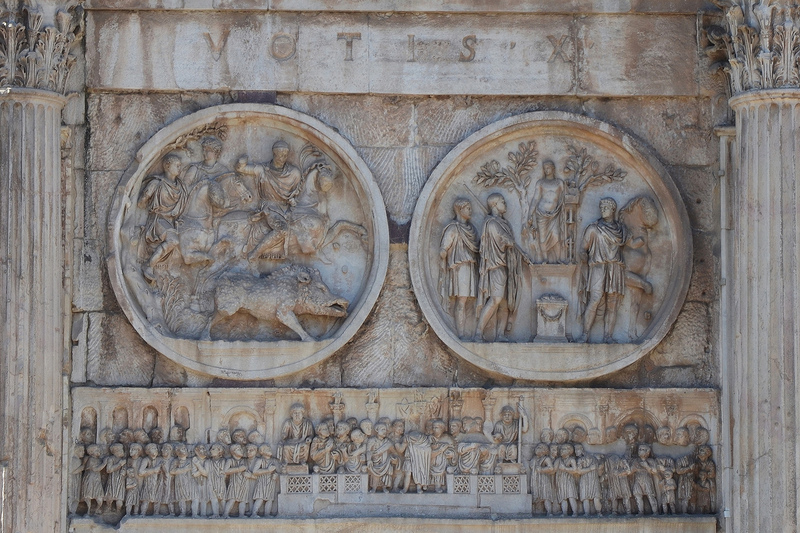 The North side of the Arch of Constantine, Rome. Standing 21 metre high and 25.6 m wide, the arch is heavily decorated with parts of older monuments. 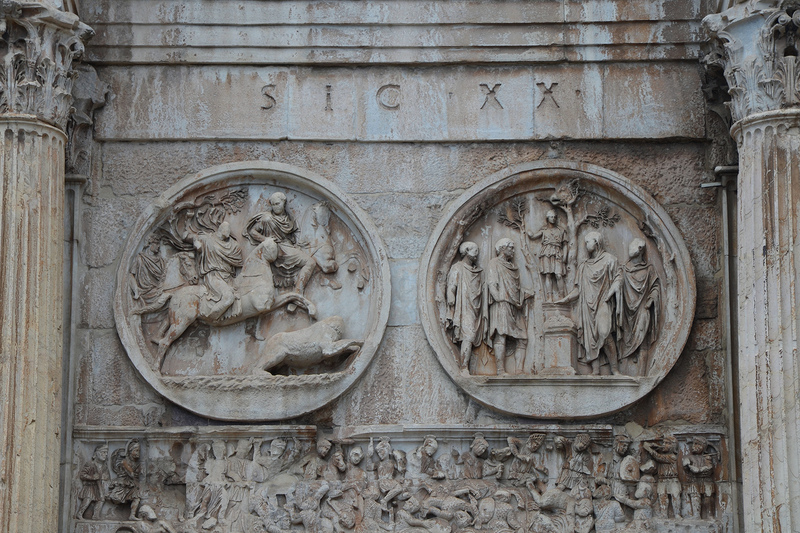 While the monument’s structure was carved specifically for Constantine, most of its decorative sculptures and reliefs can be traced to the times of Trajan, Hadrian and Marcus Aurelius. The statues of Dacians on top were taken from the Forum of Trajan. The relief panels between the statues were created for Marcus Aurelius. 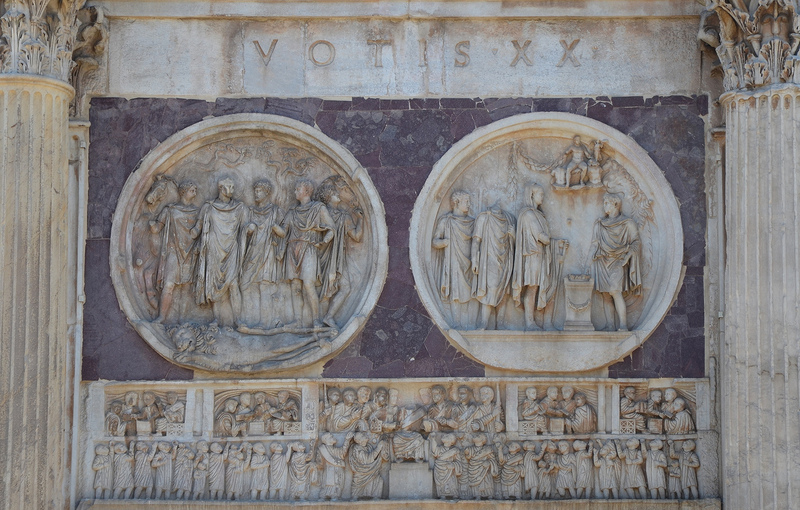 The eight roundels (tondi) were from a single monument dedicated to Hadrian. The eight large medallion reliefs (tondi) of the Hadrianic period, all in white Luna marble, decorate the north and south sides of the Arch. Their uniform circular shape of about 2.40 meters in diametre and common theme indicate that they originally belonged to a now lost monument in honour of Hadrian (possibly a tetrapylon). The tondi are arranged in pairs, two pairs on each side above the lateral archway. They depict Hadrian, Antinous and other members of the court hunting wild animals and sacrificing to four different deities. The first pair of roundels on the south side depicts Antinous, Hadrian, an attendant and a friend of the court (amicus principis) departing for the hunt (left tondo) and sacrificing to Silvanus, the Roman god of the woods and wild (right tondo). The first pair of roundels on the south side depicts a bear hunt (left tondo) and a sacrifice to the goddess of hunting Diana (right tondo). On the north side, the left pair depicts a boar hunt (left tondo) and a sacrifice to Apollo (right tondo). The figure on the top left of the boar hunt relief is clearly identified as Antinous while Hadrian, on horseback and about to strike the boar with a spear, was recarved to resemble the young Constantine. The recarved emperor in the sacrifice scene is likely to be Licinius or Constantius Chlorus. On the north side, the right pair depicts a lion hunt (left tondo) and a sacrifice to Hercules (right tondo). The figure of Hadrian in the hunt scene was recut to resemble the young Constantine while in the sacrifice scene the recarved emperor is either Licinius or Constantius Chlorus. The figure on the left of the hunt tondo may show Antinous as he was shortly before his death; with the fist signs of a beard, meaning he was no longer a young man. These tondi are framed in purple-red porphyry. This framing is only extant on this side of the northern facade. Hadrian was a tireless hunter. He spent most of his youth in Italica occupied with this activity and he continued hunting wherever he went as Emperor. These reliefs testified to his dedication to hunting as also stated in literary sources. In Mysia, Hadrian even founded a new city which he named Hadrianotherae (‘Hadrian’s Hunting Grounds’) to commemorate a particularly successful bear hunt. The head and neck of a she-bear appears on coinage minted in Hadrianotherae. A poem, so-called the “Lion Hunt Poem” and composed by the Alexandrian poet Pankrates, celebrated a lion hunt by Hadrian and Antinous which took place in the Libyan desert in 130 AD (read it here). The Emperor is said to have saved Antinous’ life during the hunt. Finally, a medallion struck in 131–132 AD shows Hadrian on horseback hunting a lion and carrying the legend VIRTVTI AVGVSTI. Revers of Medallion depicting Hadrian on horseback striking a lion with a spear with the legend VIRTVTI AVGVSTI. In time of peace, the imagery of Hadrian’s hunts was used as an expression of power and as a demonstration of his virtues. How does one know it’s a she-bear? Because we know from ancient sources that Hadrian founded the city Hadrianoutherae where he had hunted and killed a she-bear. We were in Washington recently and the facade of Union Station there is said to be modeled on Constantines Arch. Having seen your wonderful photographs I can see it certainly is (though on an industrialized scale). Très intéressant article sur l’arc de Constantin, Merci ! I was not aware they had re used some the existing masonry and re sculptured it for Constantine.Fascinating story to bring back life to this arch. Many thanks for sharing .